Oh yeah also looking forward to Maketoys' and Iron Factory's "Not" Jetfires. I forgot to add pretty much everything Iron Factory will be getting around to. My memory clearly isn't what it was....those dudes are the dictionary definition of Plastic Crack. As far as official TFs go, only the Terrorcons (although I'd rather have Ordin, I just can't afford him). For 3Ps, I can't keep track, probably MMCs stuff for the year and IFs DJD. Definitely eyeing up POTP Optimus right now. Just can't justify the cost. I have a feeling I'd like Rodimus better in the long run, but I can't decide if I want Regular or Biker Dad flavour. I'm also really looking forward to the rest of the dinos, and just like all of it tbh. I've yet to find any Legends, so Beachcomber is becoming more and more of a Need also. And mate, Battletrap? There's too much good stuff just out of my reach. POTP might as well stand for Pour Over That Person. As for stuff that lies further off in the Mists of Time, Cyberverse might be fun. If they do RID Warrior equivalents, I'm in. Can't wait to see anything from it tbh. The Movie Studio Series stuff has me aflutter as well. A new deluxe mold for Jazz? Can it be? Bring me pics. And MPM Barry ships to me next week. I'm not ready. The rest of the POTP Dinoboys (I never knew I'd be so ready for a Dinobot combiner! ), the Terrorcons, and, fings crossed, an all Fembot Galstalt! Having splurged on most of POTP wave 1, aside from the rest of the Dinobots and the Titanmasters I am probably done with it. 3p wise - MMC Thunderclash (obviously) and Hot Soldiers not Goldbug are toys I can't wait to get my mitts on. Oh if we're going into the realm of 3P, then I've gotta echo sentiments about loving what Hot Soldiers is doing and I really wanna see what they reveal next. Extremely cheap slightly-taller-than-legends for £15? I'm bloody sold. I don't really collect toys that much anymore because money's become super tight. But I do make an effort to get the few toys that really jump out at me. I'm hoping that Novastar/Firestar will be one of them, because I've always loved the character. 3P-wise, I need Boreas and the Drift/Deadlock pair from MMC, but might wait until TFN. Last edited by Pretzelcoatl on Sat Feb 03, 2018 9:55 am, edited 1 time in total. Waiting for my latest BBTS haul has been challenging. 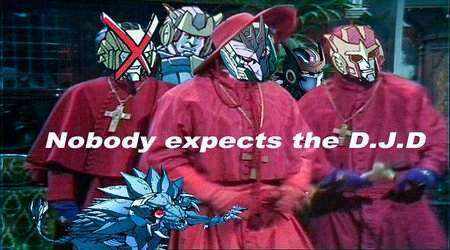 I waited for RiD Bludgeon to drop in and it was like two months longer than it was supposed to be. Coming along for the ride are PotP Starscream, Grimlock, Metalhawk, Skullgrin, and Cloudburst! As someone who owns at least one each of their molds so far: YOU GOTTA DO IT. These toys are insanely good! I knooooooow you’re so right! I think the desire to get every cassette is holding me back a bit, as I don’t need both Soundwaves. I am silly. Power of the Primes Outback. I mean, there's oodles of other stuff that's great but I loved Brawn and constantly keep forgetting Outback is coming. I love Outback. Excited for all the Generations Legends Class figures coming up, especially Battle/Trap and Cindersaur!! I've also convinced myself to go all in on the Dinobots despite my reservations on Potpie so far. I'm also super jazzed for more Hot Soldiers figures, especially that Hearts of Steel BB/Centurion figure, it looks too adorable! !